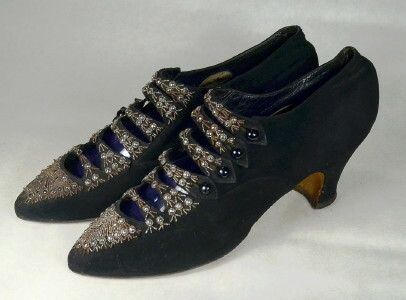 Early 1900's vintage button strap evening pumps. Black suede. Four button straps at vamp with two straps lower. Steel cut beads at straps and toe. Closed rounded point toe. Sculpted vamp applied to closed shank. Closed quarter. Louis heel. Black leather liners. Gorgeous tango pumps! Length, measured inside foot bed from toe to heel - 9 3/4"
Very good condition. Shows some moderate wear throughout consistent with shoes from this period. Also shows some tarnish & rust & a bit of loss to beads. These early shoes are generally acquired for collections/museums. Recommend for display or copy.